One of the interesting juxtopostions of my neighborhood is that in the midst of bustling businesses and court houses you find a bit of an oasis. 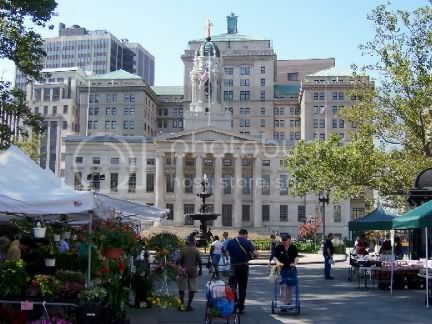 During the summer a couple of days a week, and always on Saturday their is a small farmer's market that sets up right in the shadow of Borough Hall. 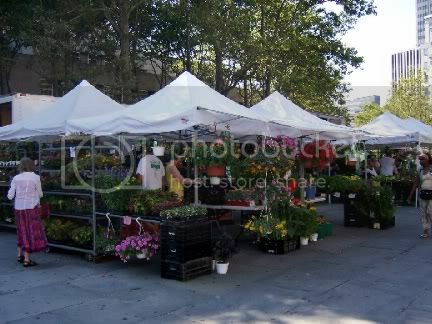 Like just about everything here in Downtown Brooklyn it is easily accessible by subway. 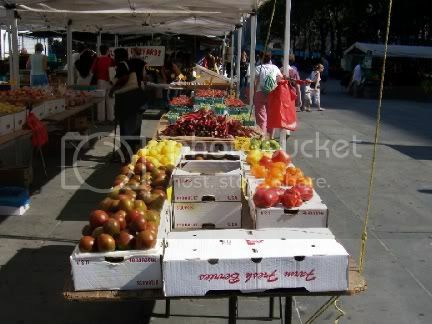 Although compared to the work-week it is relatively uncrowded here, the farmer's market always attracts a good crowd of people looking to buy fresh vegetables, fruit, flowers, bread; you name it. Looking down the stretch of vendors you can just barely make out the Manhattan Bridge in the background. The Brooklyn Bridge is right next to it and the adjacent area is now known as Dumbo, another stupid name dreamed up by a developer. In this case it stands for Down Under the Manhattan Bridge Overpass. Nobody, to my knowledge, ever referred to the Manhattan Bridge and an overpass before. Oh well, the name must work, the real estate prices in that area are some of the highest in Brooklyn now. 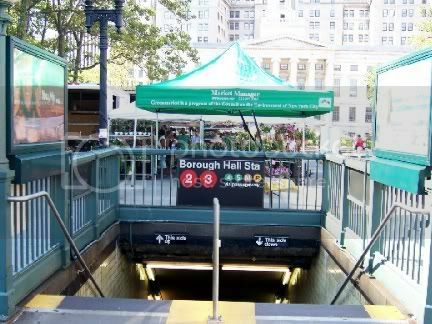 You can just pop out of the subway, buy a fresh loaf of bread, and pop back down again if you choose to do so. 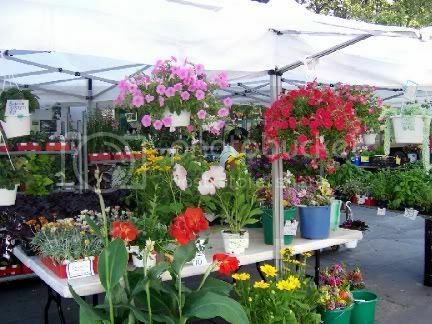 The flowers were particularly colorful on the sunny Saturday morning and I probably should have bought some for the Mysterious Chinese Woman. I failed to do so, however, and now feel remorseful. Oh well, I will buy her a hotdog and a beer at the Yankees game tomorrow. The flowers would have been cheaper though. The vegetables and fruit were also looking particularly colorful. As early as it was, they were already being picked over by hawk-eyed old women. 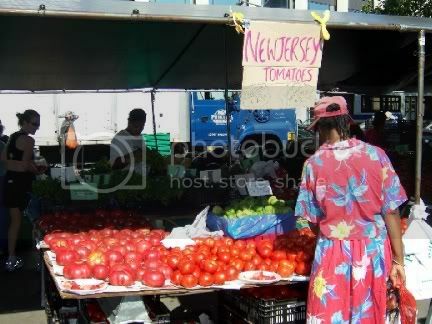 If you like tomatoes, but dislike the insipid, flavorless things you get in the supermarkets now, this is the place to go. 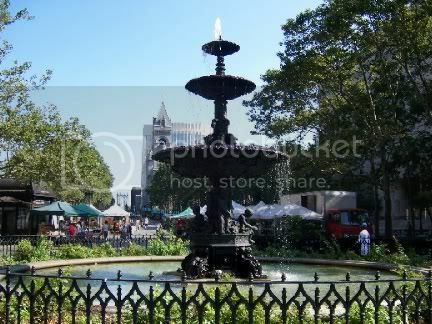 I took one last picture on the way back home that captured the lovely fountain in the very small Columbus Park that is right in front of Borough Hall, home of Marty Markowitz, our charismatic Borough Presdent who now has his eye on the exhalted title of Mayor. Watch for a run in 2010. Tomorrow I head out to a Yankees game and, although it isn't in my neighborhood, I will try to take a few pictures and post them for your amusement. I am no longer visiting bars on as regular a basis as before, who could. However I still visit interesting places on occasion, and I live in an interesting neighborhood. Well, it is interesting to me, at least. 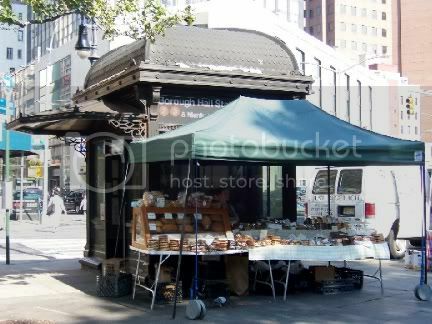 I thought I would change the direction of this blog a bit and start posting more on things and places that I find to be interesting, mostly in the area around where I live, Downtown Brooklyn, and the surrounding neighborhoods. Of course if I do visit a new bar I will certainly post on that as well. Let me know what you think about this idea. While out for a morning walked I passed by the Gowanus Yacht Club prior to its opening for the day. 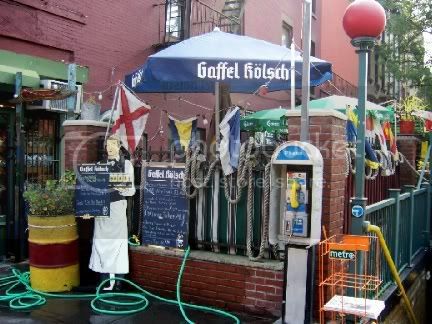 This is a decent place to pop into for a cold beer and a hamburger or a hotdog. They have cheap PBRs and a decent selection of more exotic brews, all served in plastic cups. You can get pitchers too. They also have trivia contests for your amusement and enrichment. You can find this outdoor on a cement slab with picnic tables and umbrellas place at the corner of Smith and President Streets. 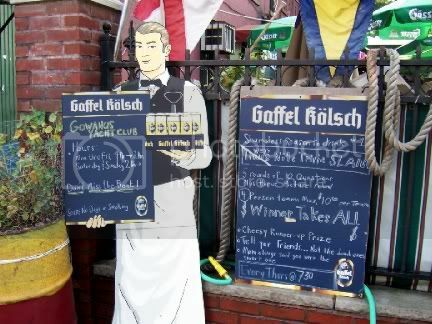 You can get there on the F or G train (there is a stop right next to it) or just take almost any train to Boro Hall and walk up the ever entertaining Smith Street. This neighborhood is Carroll Gardens although there is a move underway to rename it BoCoCa for the three adjacent neighborhoods of Boerum Hill, Cobble Hill, and Carroll Gardens. Resist the urge to use this name at all costs. It is absolutely stupid and unnecessary. 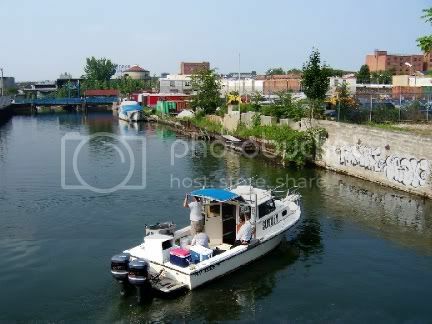 Not too far away, but far enough away so you can't smell it while sipping your beer, is the infamous Gowanus Canal. One day this may be a very upscale neighborhood itself. You could have a marina and boats can get out to the ocean from it. Right now it is still pretty industrialized and smelly at times. There has been talk of dredging it out, but there is so much chemical waste and stuff that there is a concern about how safe dredging would be. 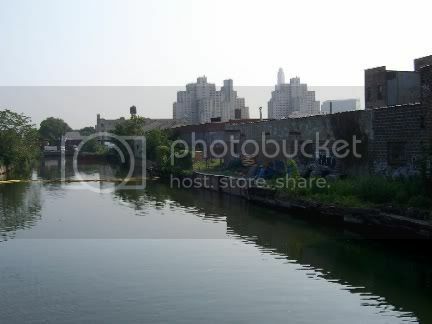 The Gowanus Canal used to be a creek but it was made into a canal and became a major commercial waterway used to transport cement, oil and coal during the 1800's. A number of cement factories and coal and oil depost still line it. A flushing system was installed but for many years it didn't work and there is no natural outlet to the canal other than the one into the ocean. Supposedly the flushing system is now working again and water is clearing up somewhat. A study is underway to decide weather or not to do a major upgrade to the system down the road a bit. There are a few art galleries opening up along here and at least one performance place, Issue Project Room at 400 Carroll Street between Bond and Nevins. This evening and tomorrow evening the School of Hard Knocks dance troupe is putting on a 7 hour piece along the banks of the canal. You could join or visit the Gowanus Dredgers Canoe Club if you wanted to get a more up-close look.